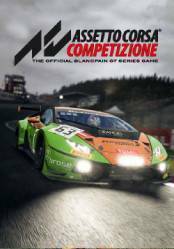 Assetto Corsa Competizione is the new official game of the Assetto Corsa saga and comes to further increase the realism and excitement in the driving genre to which we are already accustomed by this franchise. This new Assetto Corsa stands out for its excellent quality in simulation and physics in driving, offering a unique experience and creating an authentic atmosphere, and with a large number of circuits, vehicles, teams and official pilots. The level of detail of vehicles, emblems, advertising patches, drivers and recreation of the tracks, reaches incredible heights never seen before in another game of this genre. Speed, endurance and 24-hour spa races will come to life with an incredible level of realism, in both single-player and multiplayer modes. Thanks to the powerful Unreal Engine 4 graphics engine, we can enjoy a unique graphic section, even is able to recreate weather conditions with a photorealistic level. A lot of improvements have been introduced in this new title that catapults the series to new heights of realism and unique driving experience. There are no comments yet about Assetto Corsa Competizione. You can be the first one!